The days are dark and short which is not necessarily a bad thing as we can enjoy more cozytime indoors. After a stroll outside in the crisp winter weather – isn’t it nice to come back to a home where everything feels comforting and warm? Cozyness is created by dimmed lighting, perhaps some stringlights here and there, some extra fluffy cushions, warm colours and natural materials such as wood,sheepskin or wool. 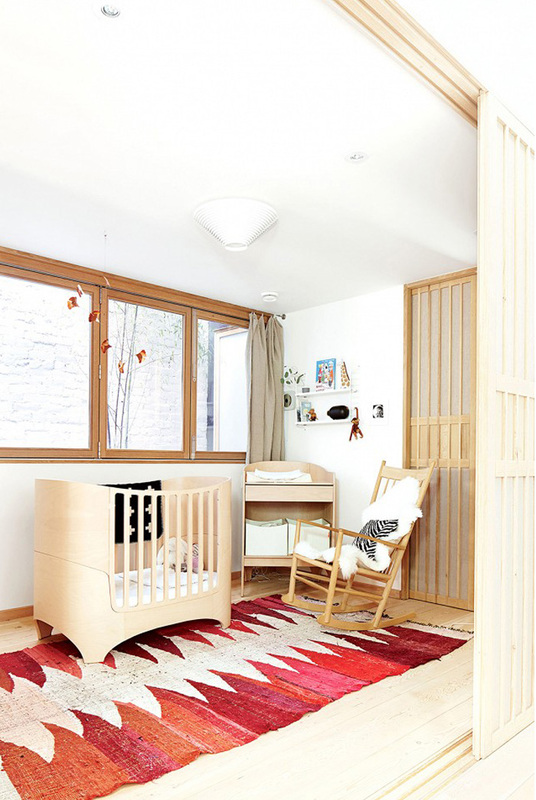 You might want to steal some of the ideas in these warm and cozy girl nurseries – and it doesn’t necessarily mean a complete renovation. 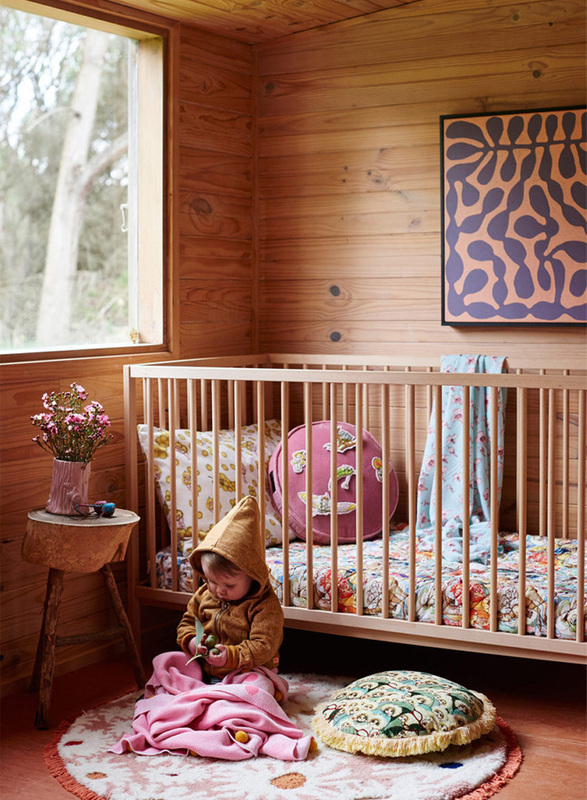 This is the perfect example of how much warmth and cozyness natural wood adds to a nursery . 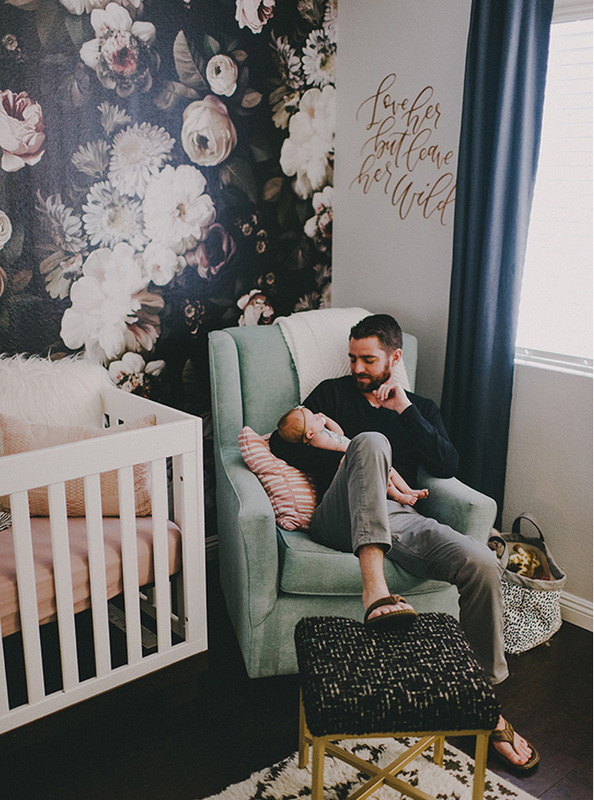 It might be a big job to place real wood panels onto the walls of your existing girl’s nursery but an alternative would be to decorate just one wall (or part of a wall) with a wooden wallpaper. It can easily be replaced with another strip of wallpaper for the spring (your girl has grown by then and might tell you that she wants icecreams or watermelons instead!) The heather flowers are so seasonal and charming and will last all winter. The colour red of course! All you need to add warmth instantly is to add just one or two red cushions or change the rug in the winter. 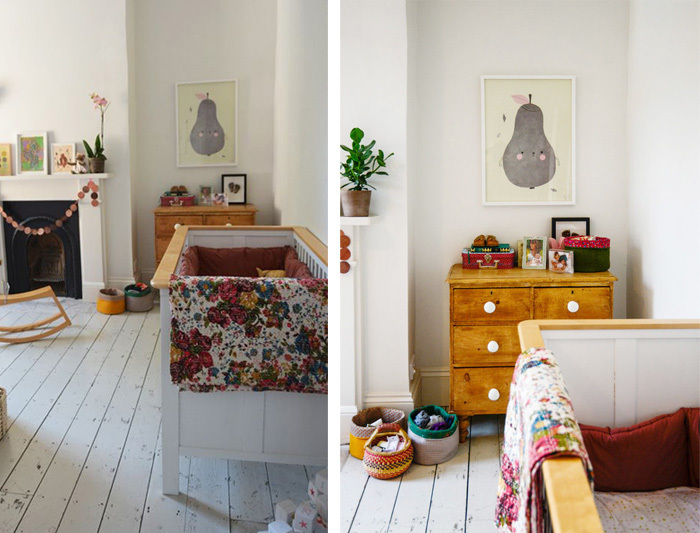 If you have a neutral toned nursery as this one in light birch wood then you could easily change the rug to a pastel coloured rug in the spring. Don’t be afraid of darker colours even if it’s dark outside! This dark flowery wallpaper looks fantastic and creates a cozy atmosphere as the other walls are crispy white. Add a fluffy Mongolian fur cushion in the crib for the wintery cozy feel. An alternative to wallpaper would be to paint just one wall in a darker more dramatic colour. 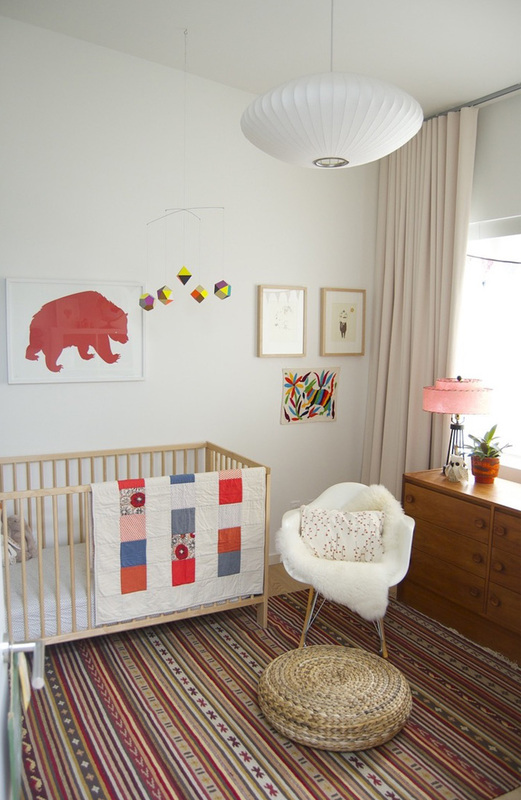 Another idea to add warmth and cozyness would be to change a poster in the nursery for a more wilderness theme like a bear poster for example and add a sheepskin that you place on the armchair of the nursery. You could also just change the crib bumper to a red warm colour and add a blanket with the same red tones that you hang over the side. 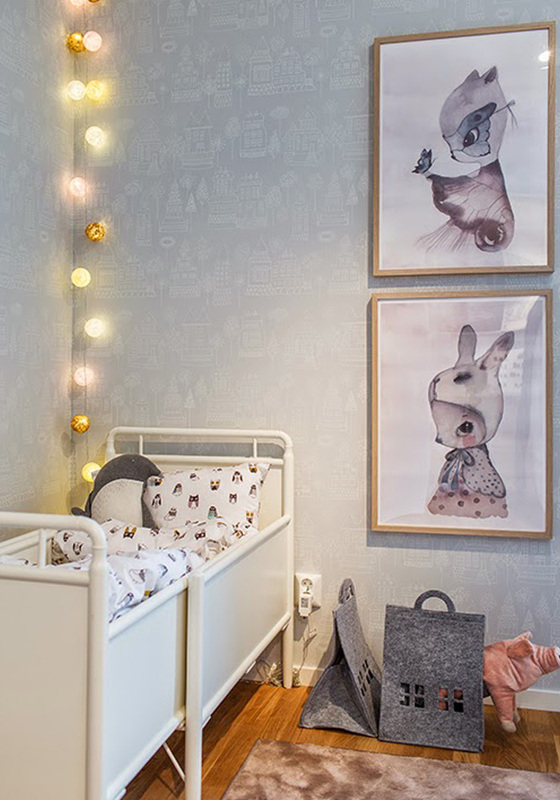 Placing accents lights rather than one bright ceiling light will make the nursery feel more cozy. 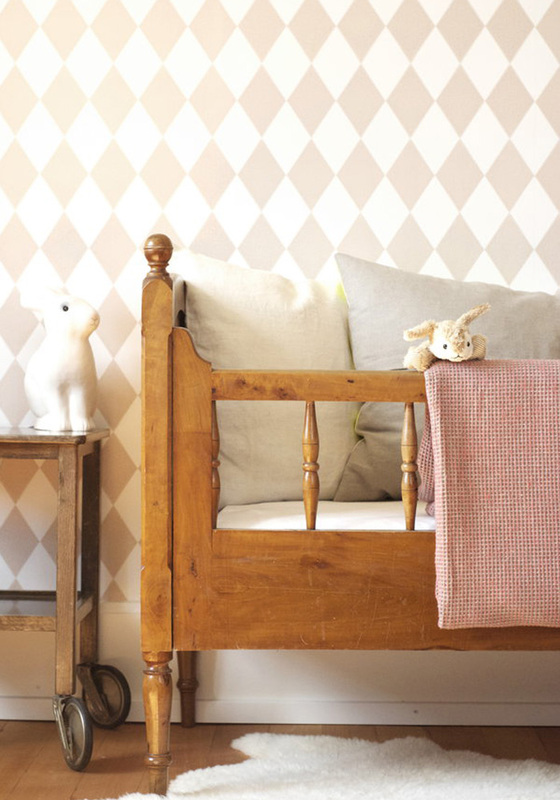 Even if you have only cotton and linen bedding in the nursery then the rug doesn’t necessarily have to be in the same materials. A woolrug on the floor won’t look out of place and you can even place a fluffy wool rug on top of the existing rug if it’s quite flat in linen or cotton. Stringlights will add magic and cozyness in almost any nursery. Any idea where the black floral wallpaper can be purchased?